Most people consider eating good food as one of the requirements of a nice trip. Food is one of the most significant factors in learning about new certain culture. The UOS Times visited Europe, specifically France, Belgium, and Germany, last winter. Just as the beautiful landscapes of Europe gave us unforgettable memories, the food we tasted helped us learn about these places more intimately. This article will provide you with information about several traditional foods from Europe, especially escargot and schnitzel. Also, we will describe each food’s taste. Escargot is one of the most traditional foods from France. The word escargot means “snails” or “dishes made of snails” in French. It became famous after Antonin Careme, a French chef, added various ingredients such as garlic, herb, and butter to snail dishes. 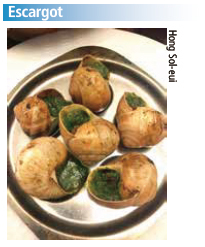 Our reporter tasted escargot in two restaurants in Paris. One was in the 6th arrondissement (near the Orsay Museum) and the other was in the 18th arrondissement (near the Basilica of the Sacred Heart of Christ). The food was provided with exclusive fork and tongs. Exclusive dishware that had six holes on the surface was also offered. You can eat escargot by grabbing the shells with tongs and taking out the snails from the shells with a fork. At first, we thought it would we thought it would be scary or weird to eat snails. Also, the green materials (perhaps herbs) that blocked the shell’s opening somewhat frightened us. However, it was very delicious and chewy, and the green material mentioned above added special flavors to the food. It was like eating Korean conch. We learned why it was one of the most beloved foods in France. Schnitzel is one of the most traditional foods from Austria, though it is eaten in both Austria and Germany. The word “Schnitzel” means “a cut slice” in German. It is a kind of cutlet made with veal or pork that becomes tender from hammering. It is similar to Cotoletta alla Milanese of Italy and the original form of German schnitzel was made in Austria.. Nowadays, schnitzel is used in various ways in several countries such as Australia, Hungary, and Switzerland, as well as countries in Latin America, too. The reporter tried schnitzel, specifically German schnitzel , in Frankfurt and Heidelberg. Almost every restaurant in Frankfurt-Sachsenhausen and Heidelberg had schnitzel on its menu. It was served with various side dishes, such as fried noodles, mushrooms, or salad, and the name of the item on the menu was different in accordance with these side dishes. It looked like a Korean or Japanese pork cutlet. However, the schnitzel patty was much thinner than that of a pork cutlet, and the schnitzel was much easier to cut and chew. Its batter was very thin, too. Therefore, it was not greasy and the reporter did not feel stuffed after eating it. 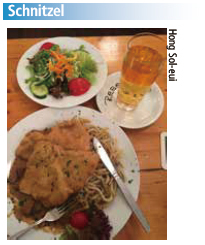 It was so delicious that it even made the reporter search restaurants that sell schnitzel in Korea. The reporter drank some very sweet apple juice together with the schnitzel, which was a good combination. These foods from Europe have remained in our minds, and we will remember their tastes forever as unforgettable memories from our trip. The UOS Times hopes that you have a chance to try these foods someday, perhaps when you go on a trip to Europe.